False alarm. 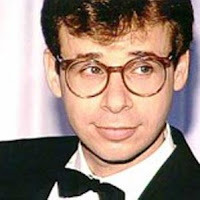 It's just another picture of Rick Moranis. I'm reading: Another Post on Christmas Eve? I'm Pretty Much a HeroTweet this! That's the Rick of Xmas Past. Also I beat you Bwah ha ha. Allie -- The Awesome Button leads to ME??!?!?!!! I love you. Like, almost as much as my husband and oxygen. Okay, maybe a little more than oxygen.